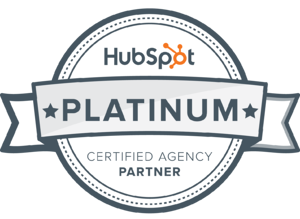 We’re proud to announce that we’ve achieved Platinum HubSpot Partner Status! Yes, in just two years we’ve risen through the ranks and become Platinum Certified by HubSpot in recognition of our commitment to helping brands achieve tangible results and generate leads with inbound marketing. We’ve worked really hard to get here, and we’re thrilled that our achievements in all things inbound have been officially recognised and that HubSpot view us as trusted inbound marketing experts. It's no mean feat becoming Platinum Certified - we’ve had to consistently deliver results and meet targets, helping our clients to grow whilst all the while growing ourselves, too. But the hard work has all been worth it - we’re currently one of just 14 Platinum Partners in the UK and the only Platinum Partner in the South West. And as inbound continues to grow and disrupt traditional methods, we’re really excited to be one of the UK’s leading inbound marketing agencies. In HubSpot’s own words, the Partner Tier Programme is designed to “acknowledge those agencies that not only bring the inbound message to their clients, but execute it to the highest possible standards”. The Programme ranges from Silver through to Diamond - and the higher the tier, the more experience and knowledge of inbound an agency has under its belt. But it’s not just about expertise in inbound - to become a HubSpot Partner and progress through the levels, you have to become a proven expert in the HubSpot platform, too. Which means that as well as giving unbeatable advice on all things inbound, we can also offer our clients a better quality of service than ever before thanks to our in-depth knowledge of the HubSpot platform. You already know that traditional marketing is outdated and that it’s fast becoming obsolete. This means that costly and time consuming outbound methods such as direct mail and cold calling are being replaced with inbound methods where you attract customers by giving them relevant and helpful content that builds trust and authority at the same time. And that’s exactly where HubSpot comes in. As one of the most effective sales and marketing platforms out there, HubSpot helps companies to attract qualified leads and close deals through informative content so you can create, launch and monitor every aspect of your digital marketing. From blog content to SEO and lead nurturing to automated emails and marketing campaigns to web hosting, HubSpot have got all aspects of your inbound strategy covered. How? By helping businesses to attract, close, convert and delight inbound leads on their journey through the buying cycle, taking them from strangers to visitors, leads to customers and finally loyal promoters. It’s a proven methodology for growing your business. It’s time to stop wasting money by trying to interrupt and instead start enjoying the benefits of attracting your customers. But inbound marketing doesn’t just happen overnight; it takes time to craft an inbound marketing strategy as well as the patience to create high-value content that appeals to your audience - and that’s why you need a game plan. First things first, you need to know who you are targeting by identifying your personas, their pain points, what their challenges are and how your product can help them overcome these challenges. Once you’ve identified your personas and their problems, you can create a strategy and begin crafting information-rich content that appeals to them by regular blogging. Finally you’ll need to generate traffic through social media, paid search and SEO and then you can begin to focus on converting those visitors into leads, your leads into customers - and eventually turn your customers into long term promoters of your product. Inbound marketing is really starting to take off. With just 16% of marketersaying that outbound practices provide high quality leads for sales, change is most definitely on the horizon - which means now is the perfect time to get involved and make the move to inbound! In order to remain a Platinum Partner, we have to stay on top of all the latest tools and technologies as well as being completely up to date with inbound marketing best practices - which means we can make your transition to inbound that little bit easier and a lot more efficient. We’ve gone all in on inbound - and we can help you do the same. Plan your inbound strategy with a platinum agency and discover inbound marketing solutions that work hard for you. What are you waiting for? Get a free Platinum Marketing Review and one hour consultation now.